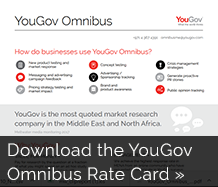 YouGov's market leading Omnibus service surveys nationally representative samples and custom groups of YouGov panelists across 16 countries in the Middle East and North Africa, India and Pakistan. Pay by the question and run as many or as few questions as you like in any single or multiple markets. Have questions about this service? Contact Kerry McLaren to find out more.